"We held our quarterly strategy session in one of the conference rooms and were really pleased with the service we received from the conference team. It was great to get away from the office for our quarterly strategy session and what a wonderful environment to be in. The room was perfect for our needs and the meeting was followed by a three course meal in the Dome Restaurant under the Dome itself. It was also good to know we were helping the students perfect their catering and hospitality skills. We’ll definitely be back. " "I just wanted to formally thank you and the whole team for the amazing event at the Devonshire Dome on Saturday 3rd December. Yourself and the events team made the organisation as stress-free as these things can be and, as always, your help is much appreciated. I would also like to formally thank the operations staff and students that worked on the event. They were a credit to the university and I have had many positive comments about their professionalism and regimented service. It is great to see young people operating in such an organised and disciplined manner. Nothing phased them on the night and they contributed to a positive experience for all." "As an event manager of ten years - I recently held one of our annual events, The Northern Design Awards, at the Devonshire Dome. I have to say what an absolute pleasure it has been. From start to the finish the entire team were a complete pleasure to work with. Nothing was too much trouble, from the many menu changes to set-up assistance on the day and the food and service on the night itself were quite simply fantastic. I cannot fault our experience in any way. Just wonderful." "We were delighted with the venue and your staff. Thank you very much for the hard work put in by all to help make it such a successful evening and we would like to re book please for next year"
"A job well done, amazing venue, great staff and a pleasure to work with - thank you!" 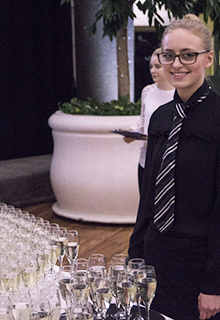 "Our client was so pleased with how the evening ran without a hitch and delegates were talking about the great food and service that they were treated to for the rest of the conference. The atmosphere was warm and you could really tell that everyone was having a good time. As an added bonus, because of our liaison before the event and your attention to detail I did not have to worry about anything and could enjoy the event"
"Both Chris and Paul have been extremely informed, organised and professional in supporting our event and we wouldn’t hesitate to recommend the venue and the team. Thank you." "Friendly and helpful staff who assisted with setting up. Good equipment with clear instructions on how to use it and good facilities. Thank you." "On Saturday 29th March I attended HF Holidays AGM held at the Dome. I am writing to tell you how impressed I was by the catering provided, such a variety of tasty food including things I hadn’t had before – all delicious and supplied in plenty, tray after tray. But it was the staff who impressed me most. Smartly turned out, friendly but not gushing, helpful and polite; they knew what they were doing and got on with it. It is always a delight to see real professionalism and it was much in evidence at the Dome. Your department is a credit to the University, perhaps I can believe, the jewel in the crown! Thank you everyone concerned for a very happy experience." "I would like to give a huge personal thank you to you and all your staff in helping to make our conference a success. To say I could not have organised the Gala Dinner without you all is an understatement!"